Concrete footing design for wall footing or continuous footing is exactly the same as designing spot footings as in concrete footing design Discover how the pros estimate the weights necessary to design continuous footings. This estimate is based on the floor shown below. The 0.8 square feet means for every foot of footing, requires 10 inches of footing in the perpendicular direction. In other words the footing needed to satisfy the design load requirement is 10 inches wide x continuous. Therefore the 1'-8" x continuous footing provided per plans is adequate for the load. 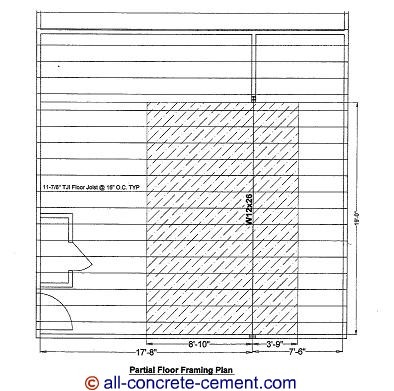 This page is a continuation of concrete footing design where design procedures for spot footings are discussed.